Abstract: Studies on number marking in /s/-deleting Spanish dialects have progressively weakened the functional hypothesis, which pertains to «the tendency for semantically relevant information to be retained in surface structure» (Kiparsky 1982: 87), by showing that neither /s/ nor any other linguistic number marker tends to be retained in surface structure. In this study, an analysis of contextual number markers, not undertaken in previous studies, further weakens the functional hypothesis by showing that contextual markers do not compensate for a lack of linguistic markers. Yet contextual markers help explain why surface structure number markers are expendable, since context indicates number for 85% of the 1,627 nouns in the sample and since only 6% of nouns are unmarked for number when both linguistic and contextual markers are taken into account. In Standard Spanish the primary number marker on noun phrase elements is the morpheme /s/. In (1), for example, /s/ marks the plural on the definite article los, the noun papeles, and the adjective importantes. (1) Los papeles importantes que me mandaste llegaron ayer. The role of /s/ as a number marker is so commonplace in Standard Spanish that speakers likely never question the need to mark the number of each Spanish noun explicitly. Yet, the loss of the morpheme /s/, which occurs in the Spanish-speaking areas of the Caribbean, Central America, the lowlands of the South America, and southern Spain, indicates that this once obligatory number distinction may indeed be expendable. The deletion of the morpheme /s/ in Spanish serves as an appropriate testing ground for the functional hypothesis, the «tendency for semantically relevant information to be retained in surface structure» (Kiparsky 1982: 87). Research on the consequences of /s/ deletion to number marking in Spanish has proceeded on the tacit assumption that number marking would be preserved in accordance with the functional hypothesis. However, the following summary of four hypotheses which have been applied to number marking (see Ranson 1992: 303-07 for more details) and the results of the present study which investigates a fifth hypothesis concerning the interaction of linguistic and contextual markers show no evidence for functional compensation of number marking in the wake of /s/ deletion. Hypothesis #1: The morpheme /s/ will tend to be retained. In other words, /s/ will be retained more often when it is a morpheme, as in los, than when it is lexical, as in luz. Contrary to this interpretation of the functional hypothesis, Terrell (1978a: 230-31), Poplack (1980a: 373, 1980b: 58) and Hundley (1987: 891) found that inflectional /s/ was deleted more often than lexical /s/. 1982: 307), Panama (Cedergren 1973: 53), Perú (Hundley 1983: 1226), Puerto Rico (Ma and Herasimchuk 1971: 692, 699-700; Terrell 1979: 42-43; Flores et al. 1983: 900), and Venezuela (Terrell 1978b: 14). This retention, though, could have been due to other than functional factors and, in any case, would not provide systematic number marking in surface structure. Hypothesis #3: The morpheme /s/ will tend to be retained, not systematically on one noun phrase element, but only when no other number markers are present in discourse. Poplack (1979: 82-90, 1980a: 377-79) found in support of the functional hypothesis that the presence of other number markers, both linguistic and contextual, favored /s/ deletion somewhat, but contrary to this hypothesis two-fifths of number markers were deleted even when /s/ was lost. Hypothesis #4: Number markers in addition to /s/ will signal number in surface structure when /s/ is deleted. Studies by Poplack (1979, 1980a, 1980b, 1981, 1984) and Terrell (1982, 1986) quantified the interaction of /s/ with various other number markers, but did not show specifically whether surface number markers worked together to preserve number marking. Ranson (1992) showed that linguistic number markers, such as the determiner los, the suffix [e] of papeles, and the verb llegaron in example (1), did not function in any systematic way to preserve a number distinction so that 36% of the 1627 nouns analyzed were unmarked for number in surface structure. These results called for removal of the surface structure stipulation, so that the newly revised hypothesis would read that there is a «tendency for semantically relevant information to be retained (whether through linguistic or contextual means)» (320). These four hypotheses show a weakening of the form of the functional hypothesis under investigation, from preferential retention of the morpheme /s/, to its selective retention, to loss of /s/ with retention of other surface structure number markers. Hypothesis #5: Linguistic and contextual number markers will interact in such a way as to signal number when /s/ is deleted. Given that number marking in Andalusian Spanish is not preserved through the retention of /s/ nor is it preserved through the interaction of other linguistic markers, the final step and the focus of the present article is to determine whether contextual markers interact with linguistic markers to preserve a number distinction. Of the multitude of studies on /s/ aspiration and deletion (see, for example, the bibliography in Seklaoui 1989), none has quantified contextual markers in order to determine the exact contribution of context to number marking and its possible interaction with linguistic number markers.60 I Several scholars have at least acknowledged the role of context in their analyses of number marking. Hammond (1979: 57) was the first to recognize the potential need to revise the functional hypothesis in light of context when he suggested that other means of marking number, including context, made it possible for /s/ to be lost without causing ambiguity. In a quantitative study of linguistic number markers besides /s/ in Dominican Spanish, Terrell (1986: 131) gave examples of nouns for which knowledge, rather than surface marking, served to disambiguate number, or for which number was in any case irrelevant. Terrell, though, did not attribute an important number marking role to context, observing that recourse to context was necessary only in a few sentences. In a study of the Puerto Rican Spanish spoken in Philadelphia, Poplack (1979: 83) included one contextual marker, shared knowledge, under the category «non-morphological support» for plural marking. It is difficult, however, from Poplack’s study to get an exact notion of the disambiguating role of context, since she grouped shared knowledge along with quantitative expressions, such as un par de, and the absence of the indefinite article, as in eran personas instead of era una persona. Ranson (1992) suggested that contextual markers, such as the shared knowledge illustrated by the phrase que me mandaste in (1), might indeed compensate for the lack of surface number markers. When context was considered in determining number, the percentage of unmarked nouns was reduced from 36% to 4%. It appeared initially that speakers could afford not to mark number in surface structure because of the disambiguating role of context. The present study, based on the same corpus as Ranson 1992, shows that even though context does mark number, it does not compensate systematically for a lack of linguistic number markers. In contrast to previous quantitative studies of number markers (e. g., Poplack 1979, Terrell 1986), which analyzed only plural nouns, this study takes into consideration all nouns, whether singular, plural, or ambiguous with respect to number. Since the deletion of /s/ often leads to ambiguity between singular and plural nouns, its loss affects the identification not only of plural nouns, but also of singular nouns. By analyzing all nouns, one also avoids the problem of inadvertently overlooking plural nouns without explicit surface markers. Poplack (1981: 64-65), for example, concluded that nouns without explicit plural markers were singular, yet occasionally context reveals a noun to be plural even though it was not marked as such by linguistic means. I adopted a conservative approach to determining number, so that I classified nouns as ambiguous whenever no conclusive linguistic or contextual number markers were present. If there was any possibility that a noun was either singular or plural, I classified it as ambiguous. In (2), for example, the noun punta probably refers to all four points of the cross and as such is plural, but I classified it as ambiguous since there was no conclusive evidence for either singular or plural. The simple fact that a cross has four points does not mean that the speaker is necessarily referring to all four of them. (2) ...la (s) punta (s) de la cruz de oro, la corona, de oro. the answer would be «any» or «all», then the number of the noun is irrelevant. This definition yields eight different categories of nouns for which number is irrelevant either because the noun does not represent a countable entity, because grammatical number does not correspond to real number, or because number is already stated explicitly. These categories are explained and illustrated below in examples (3) through (14). 1. Non-count nouns. These nouns, also called mass nouns, are by their very nature uncountable, so that their grammatical number, which is always singular, does not correspond to their conceptual number which is neither singular nor plural. Because sangre is uncountable, it would be illogical to ask «¿cuántas sangres?» for sentence (3). Other such mass nouns in the corpus for which number is irrelevant include agua, aire, alquitrán, calor, dinero, electricidad, frío, humo, and suerte. 2. Lexical. For some words grammatical number is lexically determined as either singular or plural, in a way that may differ from real number. For example, in (4), gente, which is grammatically singular, refers to a conceptual plural, as evidenced by its frequent use with a plural verb, while in (5), on the other hand, gafas is grammatically plural yet refers to a conceptual singular. I consider the grammatical number of such nouns to be irrelevant because it cannot alternate between singular and plural to reflect real number. (4) ...como esta gente tienen el dinero pueden mandar en el Ayuntamiento. 3. Modifier. Often nouns modify other nouns or verbs, thereby functioning as adjectives and adverbs, so that they do not refer to an objective reality. Upon hearing (6), it would never occur to anyone to ask ¿cuántos cines? because cine describes the type of actor (a movie actor), and does not activate in the hearer’s mind a movie theater as an object in its own right. Other examples of nouns in an adjectival use which occur in the corpus include autos de choque, cuarto de baño, dolor de cabeza and sitio de origen.62 In (7) falta functions as an adverb, part of the verbal expression hacer falta, so that it would be illogical to ask ¿cuántas faltas le hacían?» Also included in this category are fixed adverbial expressions whose grammatical number does not vary, such as de todos lados, de sobra, and al principio. (6) Está estupendamente, ¿eh? Parece actor de cine. (7) Me quitó mi padre de la escuela porque le hacíamos falta para el trabajo. 4. Totality. Another case in which grammatical number does not correspond to real number is when either a grammatical singular or plural is used to represent a whole class. In (8), for example, novias represents any bride or all brides. (8) Aquí pagan entre los dos, los novios y las novias. It would be illogical to ask «¿cuántas novias? since the answer would be «cualesquiera» or «todas» because novias does not refer to a specific group of people, but rather to the whole class. Note that to represent this totality the speaker could have used the singular as well as the plural: pagan entre los dos, el novio y la novia. This variation confirms that the grammatical number is not relevant. 5. Essence/existence. Example (9) presents an interesting case in which the expression mucho(s) trabajo(s) is ambiguous, not because of number, but because the noun trabajo can be either countable «jobs» or uncountable «work». seemed better than classifying these nouns as ambiguous, since the ambiguity is between non-count and plural, not between one or more than one objects. 6. Division. Sentences (10) and (11) are examples in which the speaker’s division of reality into parts does not change the reality itself, so that grammatical number does not necessarily correspond to real number. Even though the same reality may be divided into parts and viewed as plural or may be left whole and viewed as singular, this division is irrelevant since the reality itself does not change. (10) Eso es más que una(s) fortuna(s), tener amigos hoy. (11) En el pecho se me ha puesto blanco por la(s) parte(s) de arriba. 7. Numeral. Explicit marking can take the form of a specific number, as in (12), in which numbers indicate the plurality of pesetas and personas. In such cases it is unnecessary for the hearer to ask «how many?» since this information has already been given explicitly. (12) Ahora lo(s) que echan menos echan mil peseta(s). Si hay cincuenta persona(s) pues cincuenta mil peseta(s) que tienes. 8. Quantifier. When a quantifier, such as muchos or tantos, precedes a count noun, plurality is indicated explicitly. In examples (13) and (14), since the nouns árabe and viejo refer to people and are thus countable, the preceding quantifiers indicate plurality. Note that muchos and tantos indicate plurality only for count nouns. For non-count nouns, mucho and tanto indicate a large quantity, but not plurality, since the nouns they modify cannot be counted. (13) Aquí hay mucho(s) árabe(s) bautizado en España. (14) ...Por eso veranean viejo(s) de por ahí por aquí. B. Number Relevant and Marked By Context. In addition to cases in which number is either irrelevant or explicit, there are nouns for which number is relevant (i. e., there is a one-to-one correspondence between grammatical number and real number) and is clearly indicated by context. Contextual number markers fall into two general categories, knowledge and reference, which can be further subdivided according to whether the disambiguating information is nontextual, that is, present outside the text (exophoric), or textual, contained within the text (endophoric). 1. Nontextual knowledge. General knowledge of the world or more specific knowledge shared among speakers can serve to disambiguate number without any additional information from the text. General knowledge indicates that some nouns are inherently singular because they are «uniques», that is, they refer to only one representation in the present sphere of reference (cf. Bull 1965: 217). These include nouns such as la virgen, el Cristo, El Antiguo Testamento, and el servicio militar. Other «uniques» depend on the general knowledge that a person possesses only one of a particular item. For example, boca in (15) is unique in the context given, since one knows from perceived normalcy that a person has only one mouth. (15) [La nieta] puede caerse y se hace daño en la boca. Similarly, expressions such as mi madre and mi marido are examples of other such unique possessions. General knowledge also indicates that certain nouns are plural, as in (16), since one knows Jehovah’s Witnesses are normally referred to in the plural. (16) Testigo(s) de Jehová... también hay muchos allí en la parte de Nueva York. Nontextual knowledge can also be more specific as in (17) where the knowledge that men carry the holy week floats on both shoulders allowed me to interpret hombro(s) as plural, even though the speaker did not necessarily know that I possessed this knowledge. (17) Sale la Santa Cena... y la llevan meciéndola... a hombro(s) lo(s) hombre(s). vuelta as singular in (19). (18) Aquí se fabrica solamente ese color en la fábrica esta. 2. Textual knowledge. In other cases even though the hearer’s personal knowledge is insufficient for determining number, the text itself provides sufficient information. In (20), the speaker is looking at a picture of my parents, so that tu(s) padre(s) could be either singular «your father» or plural «your parents» were it not for the disambiguating information in the text, mayor que ella, in which ella refers to my mother. This textual information indicates that tu padre refers exclusively to my father, since it would be illogical to ask whether both my parents are older than my mother. (20) Tu padre es mayor que ella [=tu madre], ¿verdad? In (21) the verb se reparten before the noun granja and the mention of different places afterward indicates that granja is plural, since it is unlikely that one would distribute hens among only one farm and that this one farm would be located in over three different places. (21) ...la(s) gallina(s) reproductora(s) ...ya se reparten en la(s) graja(s) que hay en Andalucía o en Castilla o en Madrid o donde sea. The interpretation of number in these cases, as for nontextual knowledge, still depends on a common perception of normalcy, but it relies also on additional information provided in the text. The difference between what is classified as nontextual knowledge and textual knowledge is that the latter requires information from the text in addition to general knowledge. 3. Nontextual reference. As in the case of knowledge, reference can be either textually based or not. Nontextual reference usually takes the form of reference to an object physically present, yet not referred to in the text. In (22) reference can be considered nontextual since the speaker was referring to an object outside the text, a shawl hanging on a coatrack. Proper identification of the object or objects referred to outside the text allows the hearer to deduce its number. (22) Coge la rebeca allí en la percha. The noun referred to by nontextual reference does not even need to be physically present to the speakers, but merely perceived as present in the current situation and not yet mentioned in the text. In (23), the noun niña can be interpreted by nontextual reference as referring to my daughter. Even though she is not present in the room, we are aware of her presence in the house. (23) ¿Dónde está? Pero ¿dónde está la niña? 4. Textual reference. In (24) through (26) the nouns fábrica, día, and tendencia refer to previous or following mention of a noun or idea whose number is known. In (24), for example, the second and third occurrences of fábrica are established as singular because they refer to the first occurrence whose number was established through shared knowledge. (24) Me tuvo que venir aquí a la fábrica de ladrillo(s) ...me vine de allí, de la plaza, aquí a la fábrica. Ahí en la fábrica he estado catorce años. In (25) día is singular through textual reference to the preceding el santo, saint’s day, and in (26) tendencia is singular because it refers to a specific idea, a hacer una Europa unida. (25) ...en el santo de cada uno, siempre nos regalamos ...en mi día siempre pillo algo. (26) ...el camino que lleva es de esta tendencia a hacer una Europa Unida como están los Estados Unidos. Textual reference can also apply to plural nouns. In (27), fiestas is known through context to be plural because it refers back to the two days mentioned previously. (27) Salimos un sábado o un domingo porque claro estos son fiesta(s), así no estamos todos los días. as reference. I based this decision on the assumption that once a noun is present in the speaker’s consciousness, he or she identifies its number by merely calling it to mind again through reference rather than having to rely again on knowledge to determine the number. (28) Esto le pasó a mi madre ...Llegamos al Corte Inglés en Sevilla e iba a comprar los volantes de una colcha... Mi madre no había hablado nada. C. Number Relevant and Not Marked By Context. There are cases where number is relevant but not conclusively indicated by context, neither through knowledge nor reference. In most of the cases in which number is not indicated conclusively, as illustrated in (29) through (32), number can still be inferred by the hearer with varying degrees of certainty (for the nouns underlined). In (29), for example, one assumes with almost complete confidence that the speaker moved from one house, and not several, to another house. Yet, because it is possible for a person to own two or more houses at a time, for example, when one has a winter house and a summer house, the number of casa cannot be conclusively determined in the same way that the number of boca could in (15) above. (29) ...de una(s) casa(s) ...me mudé a otra(s). Similarly, in (30) one would assume, in the absence of any evidence to the contrary, that the speaker set up only one shop in one square so that tienda and plaza are both singular, yet nothing in the context indicates this conclusively. The fact that the speaker can be in only one place at one time does not mean that he could not own two different shops open at different times or run by different people. (30) Yo estaba harto ya de huerta(s)... y se lo dije a mi(s) padre(s). Yo voy a poner una(s) tienda(s) en la(s) plaza(s). In (31) one would assume confidently, yet not conclusively, that padre(s) is plural since both parents were probably responsible for giving candy to their children, not just the father. (31) Y en esa paja, pues, te echaban los caramelos, ...que te los ponían tu(s) padres(s) los Reyes que no te los ponían. In contrast to the previous examples in which number can be inferred, in (32) there is no way even to guess how many keys were left at the home of the speaker. (32) Si viniera mi marido podríamos subir ...es que se ha dejado la(s) llave(s) aquí. In accordance with these categories of contextual markers, I recorded and calculated the contextual markers occurring with each noun. At first I recorded these markers separately for each informant, for each of the six possible gender and number categories, i. e. masculine and feminine singular, plural and ambiguous nouns, and for the presence or absence of linguistic markers. Since no significant differences were found from speaker to speaker nor among different genders or numbers, these categories were combined below in the presentation of the results. Separate categories for the presence or absence of linguistic markers were maintained, though, since these are of course of interest in determining the interaction between linguistic and contextual markers. 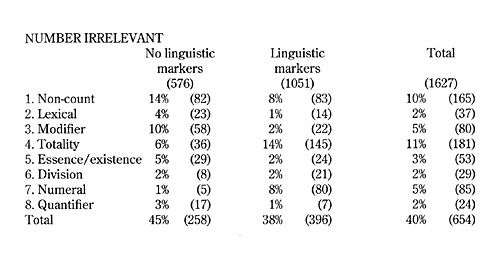 In addition to this important quantitative fact, the data in Table 1 seem to give some support to the functional hypothesis since a higher percentage of nouns with no linguistic markers are irrelevant with respect to number (45%) than nouns with linguistic markers (38%). Yet an analysis of the actual occurrences of these nouns shows that the difference lies not in a tendency of the speaker to dispense with linguistic markers when the number of a noun is irrelevant nor to perform the difficult feat of selecting a number irrelevant noun when no linguistic markers are present, but rather in a tendency for number irrelevant nouns to occur in constructions which limit the use of linguistic markers. The clearest example of such a construction is the use of a noun as a modifier. In these cases the noun is never the subject of the sentence, so that the verb is usually not available as a number marker. Determiners are often absent in these constructions as well, as in actor de cine, so that the most readily available linguistic number marker with modifiers is the suffix [e] which occurs only with consonant-final nouns. While it is true that a higher percentage of nouns with no linguistic markers are irrelevant with respect to number, it is not true that a higher percentage of nouns whose number is irrelevant occur with no linguistic markers. In fact, an extrapolation of the data in Table 1 shows that, of the 654 number irrelevant nouns in the sample, only 39% (258) of this total occur with no linguistic markers. Thus, for three-fifths of the nouns for which number is irrelevant, number is marked nevertheless by linguistic means. Therefore, the analysis of nouns for which number is irrelevant, presented in Table 1, offers little or no support for Hypothesis #5, that contextual markers will compensate for a lack of linguistic markers. This analysis does help explain, however, why surface number marking may indeed be expendable. 2. Contextual number markers do not interact with linguistic number markers to preserve a systematic number distinction. In fact, as shown in Table 2, every contextual marker without exception occurs with a higher percentage of nouns which also have linguistic markers than with nouns with no linguistic markers. This striking quantitative fact clearly argues against Hypothesis #5 since speakers apparently do not use contextual markers primarily to compensate for a lack of linguistic markers. Why should the opposite of what the functional hypothesis predicts be true? In mathematical terms, since two-thirds of the nouns in the sample (1051 out of 1627) occur with linguistic markers and over four-fifths occur with contextual markers (1384 out of 1627), it is likely that the intersection of these two groups will be high. Yet functional effects could alter this probability. Therefore, the most likely explanation is that there is no particular interaction between linguistic and contextual markers; the two are independently motivated and act independently of one another. Rather than serving to compensate for a lack of linguistic number markers, contextual number markers could be the result of other unrelated factors, such as the types of nouns used, the hearer’s knowledge of them, and the general cohesion of the speaker’s discourse. This situation may be similar to the finding, with regard to Hypothesis #1, that inflectional /s/ was deleted more frequently than lexical /s/. It was not true that the inflectional status of /s/ favored its deletion; it turned out simply that its morphological status played no role at all in its deletion. Instead other factors were at work which led coincidentally to a higher deletion rate for inflectional than for lexical /s/ for the words present in the samples analyzed. In the same way, with respect to number marking, it is unlikely that the presence of linguistic markers favors the use of contextual markers. It is more likely that the presence of linguistic markers has no bearing at all on contextual markers, which are determined instead by the structure of the discourse in ways that have yet to be identified precisely. ever attempts either consciously or unconsciously to disambiguate number. Since the speaker has the means available to add contextual number markers by providing sufficient textual knowledge and sufficient cohesion devices to ensure reference, the failure to do so points to a lack of need. An analysis of the discourse function of most nouns in my sample would reveal that only very rarely, if ever, is it important to the speaker’s purposes to express number explicitly. Horn (1984: 13) reformulated the principles of sufficiency and necessity based on Zipf’ s and Martinet’s principles of functional economy and Grice’s maxims of conversation to conclude that a speaker says as much as possible, but no more than necessary. According to the principle of necessity, a speaker will mark number explicitly only if this distinction is relevant to the message and if it is not already clearly indicated to the hearer. In my experience as a hearer in the three conversations I analyzed here, there was never a time when I needed to know the number of an otherwise ambiguous noun. As a next step, it would be interesting to identify from a discourse perspective the nouns in the sample for which number is necessary to the speaker’s purposes and then analyze the number markers of these nouns. 3. Even though contextual and linguistic number markers do not interact to preserve a number distinction, when both types of markers are taken into account, only 6% of all nouns are unmarked for number, as shown in Table 3. The consideration of contextual number markers helps explain why the 35% of nouns in the sample which are unmarked with respect to number cause little difficulty in communication. Of these, number is irrelevant for 16%, number is marked conclusively by context for 13%, so that only 100 nouns remain unmarked. Of all the nouns in the sample, the greatest number, 32% or almost one-third, are marked both by linguistic and contextual markers. The next highest group, about one-fourth of the total, are number irrelevant nouns marked by linguistic markers. It can also be seen that context signals number more often than linguistic number markers do, since only 15% of the nouns for which number is relevant are not marked by context versus 35% which occur without linguistic number markers. These data explain even further why speakers need not go to extra lengths to signal number. For their communicative purposes, it is likely that number is already signaled either by linguistic or contextual means or both more than is strictly necessary. The preceding analysis of the interaction of linguistic and contextual number markers in a sample of Andalusian Spanish has shown that contextual markers do not compensate in any systematic way for the absence of linguistic markers. In what can be considered a fifth hypothesis in testing functional effects, I have shown that number, in theory a semantically relevant distinction, does not tend to be preserved in surface structure nor even in context when this tendency is defined in terms of compensation. Contextual markers occur more often when linguistic markers are also present and less often when linguistic markers are absent. Even though the analysis of contextual number markers does not suggest a tendency toward preservation of number marking in line with the functional hypothesis, it does in any case explain why the reduction of linguistic number markers has little affect on communication. When both contextual and linguistic number markers are taken into account only 6% of the nouns in the sample are unmarked for number. hypothesis, but on the semantic relevancy of number as well. It appears that theoretical semantic relevancy is not sufficient to warrant signaling. A distinction must be in line with the speaker’s goals for him or her to signal it. The revised version of the functional hypothesis, which is so far removed from the original intention that it hardly deserves the name functional (cf. Ranson 1991: 149), would read «there is a tendency for information important to the speaker’s purposes to be expressed through linguistic or contextual means». Alonso, Dámaso. 1956. En la Andalucía de la E. Dialectología pintoresca. Madrid: n. p.
Alonso, Dámaso, Alonso Zamora Vicente, and María Josefa Canellada de Zamora. 1950. «Vocales andaluzas. Contribución al estudio de la fonología peninsular». Nueva Revista de Filología Hispánica 4: 209-30. Bull, William E. 1965. Spanish for Teachers. Applied Linguistics. New York: Ronald. Cedergren, Henrietta. 1973. «The Interplay of Social and Linguistic Factors in Panama». Diss. Cornell U.
Flores, Luis, John Myhill, and Fernando Tarallo. 1983. Competing Plural Markers in Puerto Rican Spanish. Linguistics 21: 879-907. Hammond, Robert M. 1979. «Restricciones sintácticas y/o semánticas en la elisión de /s/ en el español cubano». Boletín de la Academia puertorriqueña de la lengua 7: 41-57. Horn, Laurence R. 1984. «Toward a New Taxonomy for Pragmatic Inference: Q-Based and R-Based Implicature». Georgetown University Round Table on Languages and Linguistics 1984. Ed. Deborah Schiffrin. Washington, D. C.: Georgetown UP. 280-92. Hundley, James E. 1983. «Linguistic Variation in Peruvian Spanish: Unstressed Vowel and /s/». Diss. U of Minnesota. _____. 1987. «Functional Constraints on Plural Marker Deletion in Peruvian Spanish». Hispania 70: 891-94. Kiparsky, Paul. 1982. Explanation in Phonology. Dordrecht: Foris. Lafford, Barbara Armstrong. 1982. «Dynamic Synchrony in the Spanish of Cartagena, Colombia: The Influences of Linguistic, Stylistic and Social Factors on the Retention, Aspiration and Deletion of Word Final /s/». Diss. Cornell U.
Ma, Roxana and Eleanor Herasimchuk. 1971. «The Linguistic Dimensions of a Bilingual Neighborhood». Bilingualism in the Barrio. Ed. Joshua A. Fishman, Robert L. Cooper, and Roxana Ma. Bloomington: Indiana UP. 636-835. Poplack, Shana. 1979. «Function and Process in a Variable Phonology». Diss. U of Pennsylvania. _____. 1980a. «Deletion and Disambiguation in Puerto Rican Spanish». Language 56: 371-85. _____. 1980b. «The Notion of Plural in Puerto Rican Spanish: Competing Constraints on (s) Deletion». Locating Language in Time and Space. Ed. William Labov. New York: Academic. 55-67. _____.1981. «Mortal Phonemes as Plural Morphemes». Variation Omnibus. Ed. David Sankoff and Henrietta Cedergren. Edmonton: Linguistic Research. 59-71. _____. 1984. «Variable Concord and Sentential Plural Marking in Puerto Rican Spanish». Hispanic Review 52: 205-22. Ranson, Diana L. 1991. «Person Marking in the Wake of /s/ Deletion in Andalusian Spanish». Language Variation and Change 3: 133-52. _____. 1992. «Nominal Number Marking in Andalusian Spanish in the Wake of /s/ Deletion». Hispania Linguistics 4.2: 301-27. Seklaoui, Diana R. 1988. «The Role of Context in Language Change». Synchronic and Diachronic Approaches to Language Variation and Change. Ed. Thomas J. Walsh. Georgetown University Round Table on Languages and Linguistics 1988. Washington, D. C.: Georgetown UP. 280-92. _____. 1989. Change and Compensation: Parallel Weakening of /s/in Italian, French, and Spanish. New York: Peter Lang. Terrell, Tracy D. 1977. «Constraints on the Aspiration and Deletion of Final /s/ in Cuban and Puerto Rican Spanish». The Bilingual Review 4: 35-51. _____. 1978a. «Aportación de los estudios dialectales antillanos a la teoría fonológica». Corrientes actuales en la dialeciología del Caribe hispánico. Ed. Humberto López Morales. San Juan, Puerto Rico: Editorial universitaria. 219-37. _____. 1978b. «Aspiración y elisión de /s/ en el habla de Caracas, Venezuela». Paper presented at the fith conference of the Asociación de Língüística y Filología de América Latina (ALFAL), Caracas, Venezuela. _____. 1979. «Aspiration and deletion of final /s/ in Cuban Spanish». Hispania 62: 599-612. _____. 1982. «Relexificación en el español dominicano: Implicaciones para la educación». El español del Caribe. E d. Orlando Alba. Santiago, Dominican Republic: Universidad Católica Madre y Maestra. 301-18. _____. 1986. «La desaparición de /s/ posnuclear a nivel léxico en el habla dominicana». Estudios sobre fonología del español del Caribe. Ed. Rafael A. Núñez Cedeño, Iraset Páez Urdaneta, and Jorge M. Guitart. Caracas: Bello. 117-34.